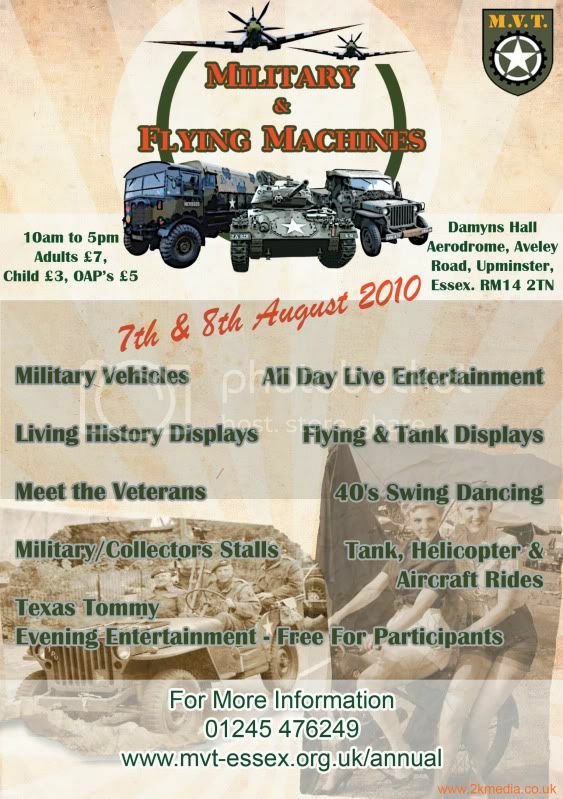 I would like to let you all know the 2010 Essex MVT Military and Flying Machines Show. The show will be held on the 7th and 8th of August at Damyns Hall Aerodrome, Upminster, Essex and we would love you to come along. Last year about 7000 public saw around 60 displays covering all era’s including the Medieval camp, WW1, WW2, Korea, Northern Ireland and beyond, and I would really like to build on this. There will be a large Marquee with indoor bar, with 'Texas Tommy' providing the free entertainment on Saturday night. Singletons and period civilians are very welcome! You do not have to book a pitch and display to be a part of the show. We are more than happy to accommodate those who like to mingle with the crowd. And still not one single medical display! Last edited by rgb on Tue Jun 01, 2010 13:04, edited 1 time in total. 25 pound artillery guns – Firing! Children’s ‘Mini Jeep’ and ‘Mini Landrover’ rides. To make things more comfortable for the groups and vehicle owners who are staying overnight, we have got more toilets and catering than last year, and there will be Saturday night entertainment from ‘Texas Tommy’ with music from the 40’s and 50’s, which be free to all participants in our 700 person Marquee.